After talking with tons of people in the haunted attraction business, I found some common themes. All of the owners of these haunts are crazy about Halloween. They all started off small and started to grow bigger. And nearly all, at some point, took a huge risk by quitting their day jobs and focusing on the attraction full time. None of them are nearly as gutsy as Edward Terebus. Jim, Edward’s brother, got laid off of his job many years ago and decided to open a haunted house. Ed jumped right in and decided to help! So they did what anyone would do in that situation… risk it all by opening up a haunted house in a mall parking lot in Pontiac, Michigan. Yep, he bought 10 trailers; some were previously used as model homes and even had flash fires in them. Needless to say, he bought them for a song. That mall parking lot haunt proved to be successful, but with most haunts that need to be assembled and torn down at the end of the season, you find yourself chasing your tail after a while. It’s hard to focus on quality and improvements if most of your time is spent just putting the pieces together and then storing them again until next year. Edward decided to double down and remortgaged his house, while his brother Jim sold his, in order to buy a 100,000-square foot (that’s not a typo!) building in downtown Pontiac. The good news: The building was dirt cheap. The bad news: It had previously been used as a junkyard of sorts and had no electricity or plumbing. So Edward Terebus did 90% of all the work himself to get this mammoth building back up to code. He literally slept on the 3rd floor every night while doing the renovations, while plaster on the ceiling would rain down on him during the night. With no plumbing, he would do his business in a bucket. Then he would take it across the building and down three floors to dump it out in the back alley after he was finished. That, my friends, is dedication. Admittedly, Edward bit off more than he could chew. He owed literally every friend or family member he knew money at one point, but Erebus Haunted House still opened and it thrived. Edward went 8 years without a paycheck working to pay down his initial investment and everyone he owed money to. 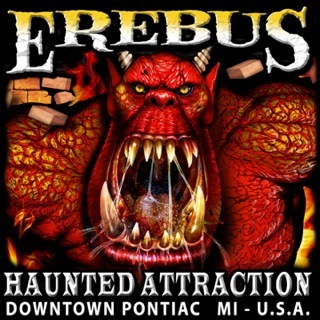 For five seasons, Erebus Haunted House was listed in the Guinness Book of World Records as the largest haunted house in the world, only to have the record taken from him by a haunt in Texas. The path you take to get through the house is over a half-mile long and can take up to 45 minutes to go all the way through. It’s not just big, it’s enormous. The theme of the house is simple. Dr. Goldberg invented a time machine. Instead of doing the noble thing, he uses people coming to a haunted house as guinea pigs to test it. So he opens up different portals that people can walk through, which are set in different time periods and places all over the world. This allows guests to enter portals just about anywhere in the world, from ancient Egypt to an alien spacecraft. Spoiler alert: In each new location guests find themselves in, something goes terribly wrong. In the case of Erebus Haunted House, it’s a full-on contact house. You will be touched by props, actors and air cannons. 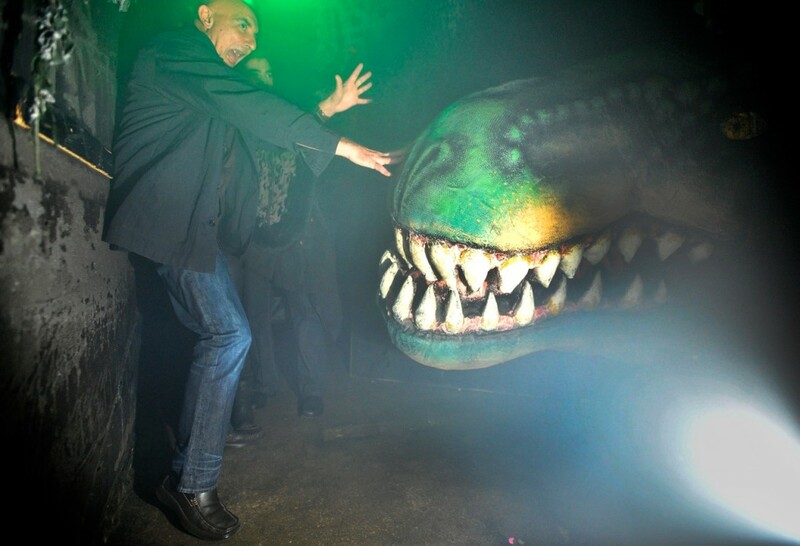 You may have a close encounter where a T-Rex will pin you against a wall or a figure named Uncle Freddy could fly through the air and land right on top of you. Guests are encouraged to remove hats and glasses before they enter, because there is a good chance they will be knocked off. 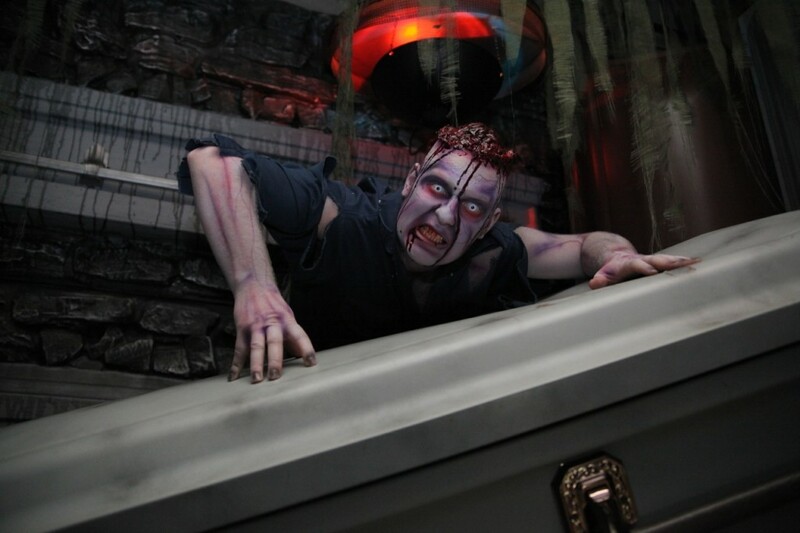 Erebus was actually the first to pioneer certain effects in a haunt including pushing through giant air filled vinyl bags to get from one section to the next – and this was long before they were available to the public through tons of online haunted house websites. 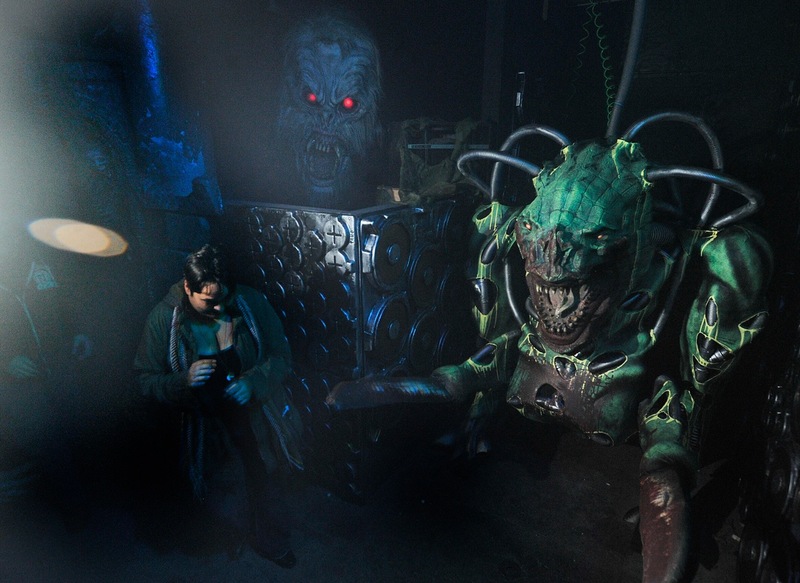 These types of scares are what help set Erebus Haunted House apart from the rest of the haunts in the Michigan area, which has the most haunted attractions than any other place in the country. 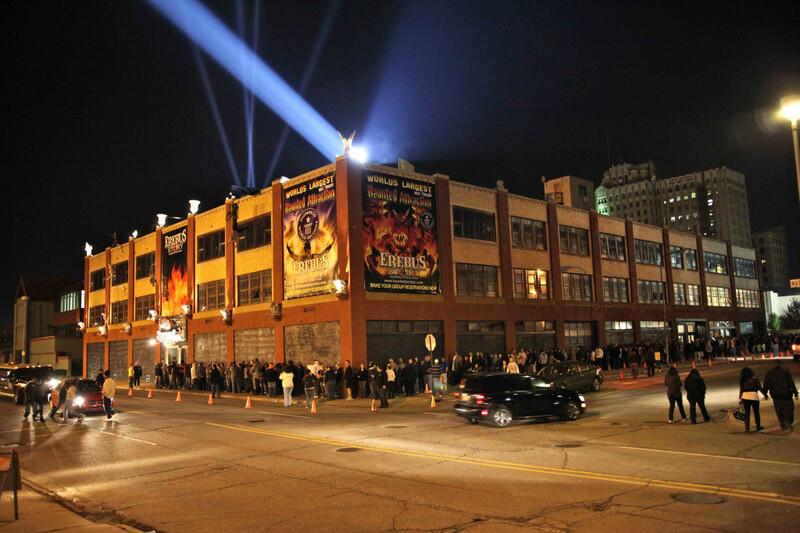 Erebus may not be the largest in the world anymore, but it definitely has carved out a place in the history of haunted attractions. 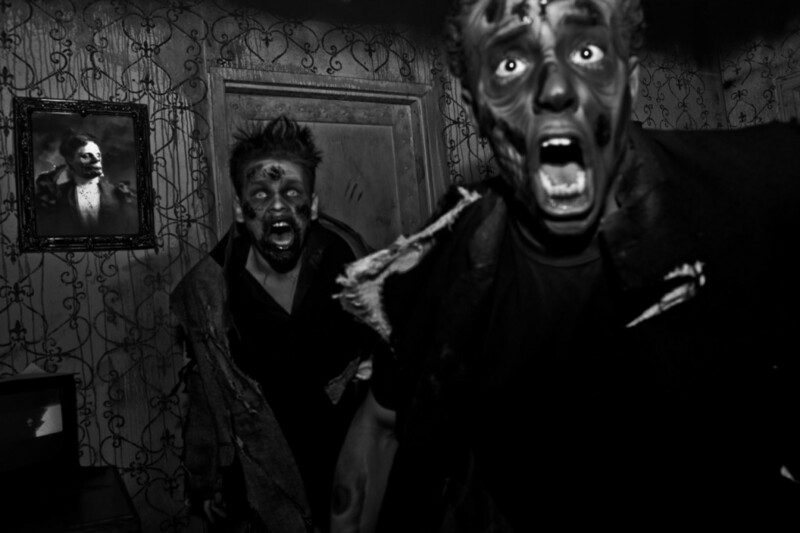 If you want to find out more on Erebus Haunted House in Pontiac, Michigan visit their website at www.hauntedpontiac.com. For more stories on themed entertainment, follow Theme Park University on Twitter by clicking here or like our Facebook Page by clicking here! This entry was posted in Haunts and tagged Edward Terebus, Erebus Haunted House, Michigan Haunted House, World's Largest Haunted House. Bookmark the permalink. Trackbacks are closed, but you can post a comment.